Selling coins for the best possible price is done by following the well tested methods used by the coin collecting community. Collectors routinely sell some of their coins and use the proceeds to upgrade their collections. And in every case the basic method of getting the most for their coins is the same. Here are the two main points successful collectors adhere to when selling coins. First and most important, understand the value of your coins in order to know what to expect is a reasonable offer. Certain coins sell best to certain dealers. Low value, medium and high value coins each have their unique best selling practices. These two key points, when kept in mind steer your decisions about the rest of the details covered below. Too often people over value most of their coins, and unfortunately, under value the truly rare coins. In order to place yourself closer to an equal footing with the dealer as you negotiate selling coins, have an accurate understanding of their wholesale value. Use the value charts of the different series throughout this site. They alert you to, and describe, the factors determining value, such as date, mintmark, and the condition of your coins. Now sell old coins up to their true potential by separating your collection into low - medium and high value coins, enabling you to find the best dealer for each. Sorting through all the different coin dealers to find the best for your situation is the next step. You are looking for specific dealers to handle each value range, low-medium and high. Coin dealers and auction houses, your two main avenues of selling coins, are found locally in your area, online and by dealer ads within periodicals. As you visit dealers either locally or online, compare your coins to those offered for sale. You are looking for someone handling coins similar to yours. Local Dealers: Starting with your local dealers, here you find the shops contain close matches to your low and medium value coins. This is a good place to discuss your coins that fall into that range. Doing business at the local shop is convenient, you meet the dealer face to face, and conclude the transaction on the spot. Coin Shows: Hosted all over the country, they bring together tens to many hundreds of dealers, depending on the size of the convention. Here dealers representing the complete range of coin values, from the low end to the very rare and valuable are found. Mixed results are reported when selling at coin shows. Far more transactions accrue between dealers than buying from the public. However it is a good place to establish contact, get to know and decide upon a dealer for a future transaction. Online Coin Dealer Sites: Searching through online coin dealer sites is one of the fastest ways to find someone actively buying and selling coins similar to your quality of material. Many feature and promote their desire to buy coins. The best method of selling coins to online dealers is matching your coins’ value range to the dealer’s value range. For example, a dealer of high end material is not in a position to best serve your needs when it is time to sell rolls of wheat pennies. However, with a little searching, there are many dealers with an active market in wheat penny rolls. Selling coins to them is quick and efficient. Print Media - Newsprint and Periodicals: Among the print media there are many excellent specialty publications, two of the biggest, covering the hobby in general, are Numismatic News and Coin World. In particular the Coin World site has a sample issue you can read online, complete. While there, search for dealers who advertise and maintain a presence within the coin collection community. Some firms have advertised in these pages for years. Your local coin shop most likely sells these coin magazines from the counter. It makes for an interesting trip. After you evaluate your coins, and then separate them into low-medium-and high value, visit the local shop. Pick up a Numismatic News or a Coin World, and have a look around the shop while there, it becomes a fun research and fact finding trip. 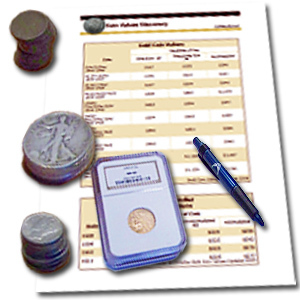 Rare Coin Auctions: Often yielding good results, placing your coins into an auction is one method of selling coins. The right auction with an enthusiastic group of bidders can bring results to you, the seller, closer to the retail side of the market. And of course should this combination be reversed, the bidders walk away with a good deal for themselves. This uncertainty and excitement is the nature of a public auction. However let’s try to push the, selling your coins for good value, swing into your favor. You obtain the advantage at an auction, first by knowing the value of your coins, low-medium to high, then choosing an auction that features material exactly as yours. Follow this precisely, and you likely get a fair price for your coins. Auctions themselves come in small, medium, to large operations. And can cover areas just locally or have grown into regional wide firms with a larger draw of bidders. And there are some very big rare coin auctions, having a national audience. Combine traditional auctions with the online auctions taking place, and the situation is coins are auctioned every day. Here is a review of the cost to you of selling coins through auctions. A seller’s fee of 10-15% is typical, and a fee to the bidder of 10-15% applied to the final bid, is also typical. Additionally, check on the expected amount of time between consignment of your coins and receiving payment after the sale. As you can see, selling coins requires some extra research and legwork. However if you persist, and do it well, the pay off is knowing you received the best value for your box of old coins. Let’s wrap it up and overview the most important step in selling coins. Accurately understand the value of your coins, match them to the right buyer and you will receive the best price when selling coins. You have in your possession now, a "box of old coins." Turn it into a valuable asset and start the process of selling by first understanding their value. Coin Values Discovery helps Selling Coins, and is an excellent index leading to US coin values. Including in-depth coverage of just what is required to accurately value old coins, from dates, to mint marks, to judging condition. 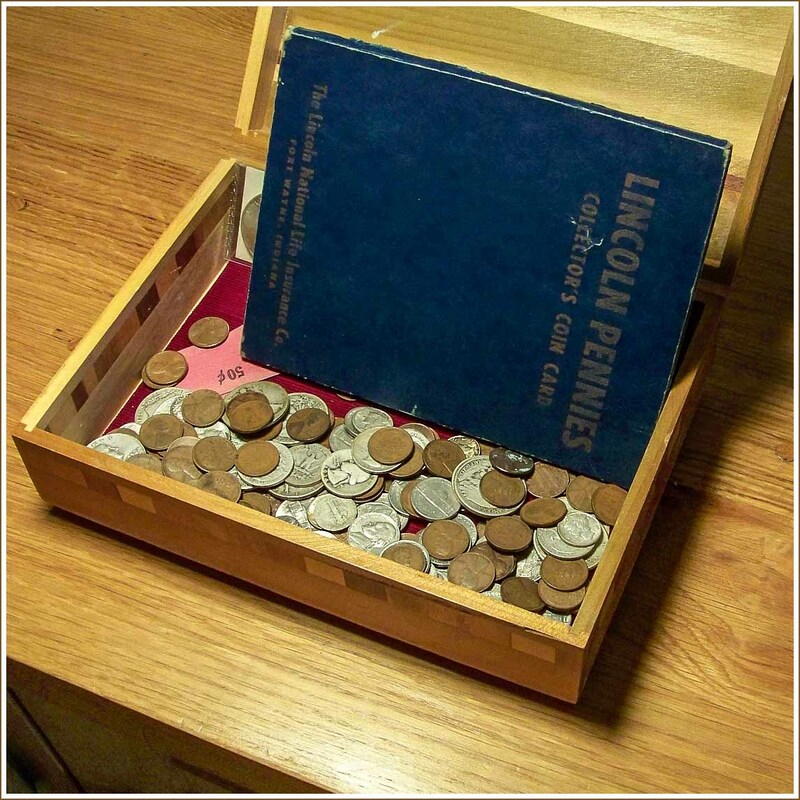 Discover the treasure in your box of old coins.